From left to right: Emma Gee (’19), Madelyn B. Dickson (’19), Olivia J. Hoj (’20), Madeline E. Cannon (’20), Erica Birk-Jarvis (’19), Coach Diljeet Taylor, Courtney Wayment-Smith (’20), Sadie Sargent (’22), Aubrey M. Frentheway (’22), Anna Camp-Bennett (’21), Sara G. Musselman (’21). Photo by Jaren Wilkey. 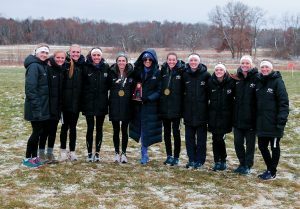 BYU had its best school showing ever at the 2018 NCAA Cross Country Championships, with outstanding men’s and women’s team performances. Check out the Cougars’ feats by the numbers. No. 2 team finish for the BYU men—their best ever. No. 7 team finish for the BYU women, up from their No. 9 pre-nationals seeding. 6 All-Americans—the most in one season for BYU—including Erika Birk-Jarvis (’19) and Courtney Wayment Smith (’20) for the women and Rory E. Linkletter (’19), Conner B. Mantz (’22), Connor R. McMillan (’19), and Clayson K. Shumway (’21) for the men. No. 7 individual finish for Birk-Jarvis, the first Cougar to cross the finish line for the women. No. 10 individual finish for Mantz, the first Cougar to finish for the men and a pack leader for several kilometers. 14 Cougars ran at NCAA nationals, seven men and seven women. 112 kilometers raced by the Cougs at nationals, combined; the men ran a 10K and the women a 6K. 33 degrees Fahrenheit was the high on race day in Madison, Wisconsin, the site of nationals. 2 West Coast Conference titles clinched—one men’s and one women’s. 4 consecutive West Coast Conference titles for the BYU men’s team. From left to right: Conner B. Mantz (’22), Jacob Heslington (’20), Rory E. Linkletter (’19), Clayton A. Young (’19), Connor R. McMillan (’19), Brayden T. McLelland (’20), Clayson K. Shumway (’21). Photo by Jaren Wilkey. 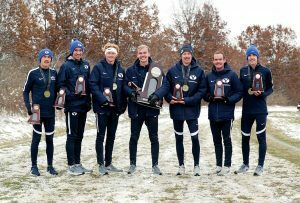 How did BYU men’s cross country team win the WCC championship with a perfect score? With some help from Cavemen. Meet the family of the youngest-ever BYU alum—and see how they run.